Never Too Little to Love is an adorable little book with many endearing qualities. That vibrant red cover, adorned with shiny gold hearts, opens to reveal the dilemma facing Tiny Too-Little. 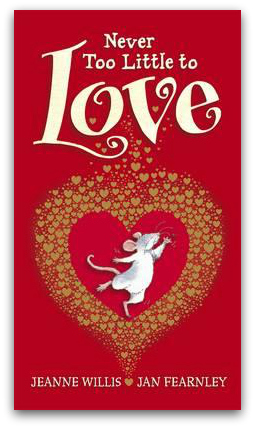 Tiny Too-Little is a cute little mouse, but the ‘somebody’ he is in love with is ‘right up there’. That’s a really long way for a little mouse … but even a thimble, a matchbox, a melon leading an eclectic mix of objects can’t quite help him reach. Luckily his ‘somebody’ has a solution – and a very cute one at that. This edition features a little pop-up at the end, and various cut pages (reminiscent of the ‘fruit’ pages in The Very Hungry Caterpillar). Never Too Little to Love is just perfect for little hands, and is a featured titled on our list of the Best Mother’s Day Books.